The Bushman has been a mainstay of the Cold Steel line for more than a decade now. The folding blade is long and wide with a short, sharp, clip point for usefulness and versatility. The Krupp 4116 stainless steel blade is also hollow ground from top to bottom with just enough belly to be useful for different tasks. The handle is constructed from 420 series stainless steel with bead blast finish and Ram Safe locking mechanism. Includes lanyard hole with nylon cord. 4 1/2 in. blade, 10 1/4 in. overall. Ok, I must say the blade quality is top notch but as for an EDC I would seriously discourage it. This knife can be dangerous, more so then many other knives. The ram lock is Ideal for basic bush craft but having a stainless steel handle, the ram lock can be very dangerous especially if you are doing work with this knife and your hands are sweaty. I recommend gloves and keeping your fingers away from the blade and closing with 2 hands ( 1 hand operating the ram lock release and the 1 hand BEHIND the blade) to close it & remember to use the lanyard. Don't grip the knife in a normal neutral grip while closing it, the ram lock spring is stiff and your fingers can slip and cause a nasty cut. if you are good at MODs I would recommend gluing on some kind of rubber to the stainless handle to give you some kind of grip. Again, follow the directions to proper opening but extremely careful when trying close it. Another point I would like to make. DO NOT try to pull the ram lock too open it, I see way too many YouTube videos of guys doing this and it is stupid. That's not how you open the knife. If you need to, loosen the tension in the main bolster pin. You can really FUBAR the spring that operates the ram lock by pulling on it to open it. For the price you cant beat work quality but keep it in your B.O.B. and leave it there. Its not a very good EDC knife, I would recommend any one of the other cheaper knives on this site for every day work. This was marketed as an extremely durable folding knife and somewhat suitable for heavier uses than a regular small folder. The locking mechanism is very strong, highly unlikely to disengage by accident. Therefore, it is unwise to try and open the knife one-handed or quickly. Its strong lock also gives it strong closing retention, making it important to open and close carefully! Krupp steel is often used in kitchen cutlery because of its high corrosion and stain resistance. Although edge retention is not typically associated with high stainless steels, the edge on the Pocket Bushman stays reasonably sharp even though I chop, dice, and slice carrots and potatoes on a regular basis (blade came very sharp). The handle resists staining and corrosion as well, making it especially helpful when working around water or food. Why was it great for food preparation (besides its stainless nature)? The strong lock resists shock and impact when cutting dense and hard material. The length, width, and hollow ground nature of the blade allows it to cut food easily. Lastly, the design is very simple, allowing easy maintenance and clean-up. This thing is huge! The blade is as wide as half my thumb's length, and when closed, this knife is almost as long as my hand! After seeing the video on the cold steel website, and spending two hours whittling a 2-inch thick stick down to half an inch and still being able to cut thick printing paper with ease. I have to give this thing a 5/5. Delivery was fast, as always. I ordered the pocket bushman on Thursday and it got here on Saturday. This is my second order from True Swords, and by far me favorite, and I can honestly say, this won't be my last. This thing is MASSIVE!! I love it. My new EDC. Don't spend to much time opening and closing it, the spring is a beast. wow. if you want a great working knife then this is it. 1. It is huge! i was suprised at the size of it, but its still great. 2. the blade is amazingly sharp. i opened it up, found some cardboard, slice through it like a piece of paper. 3. the locking mechanism is weird, yet very functional. if you have watched the cold steel video you know that in the opened position, held by the blade, this locking mechanism can hold up to 250 Lbs. thats amazing. overall i would say that this knife is a total steal. i would deffinitaly get it if i were you. cold steel has done it again. thank you true swords! A few months ago I started collecting "Cold Steel" items. I recently received this Bushman folder, this is NOT a small knive, it is quite large and has some weight to it. 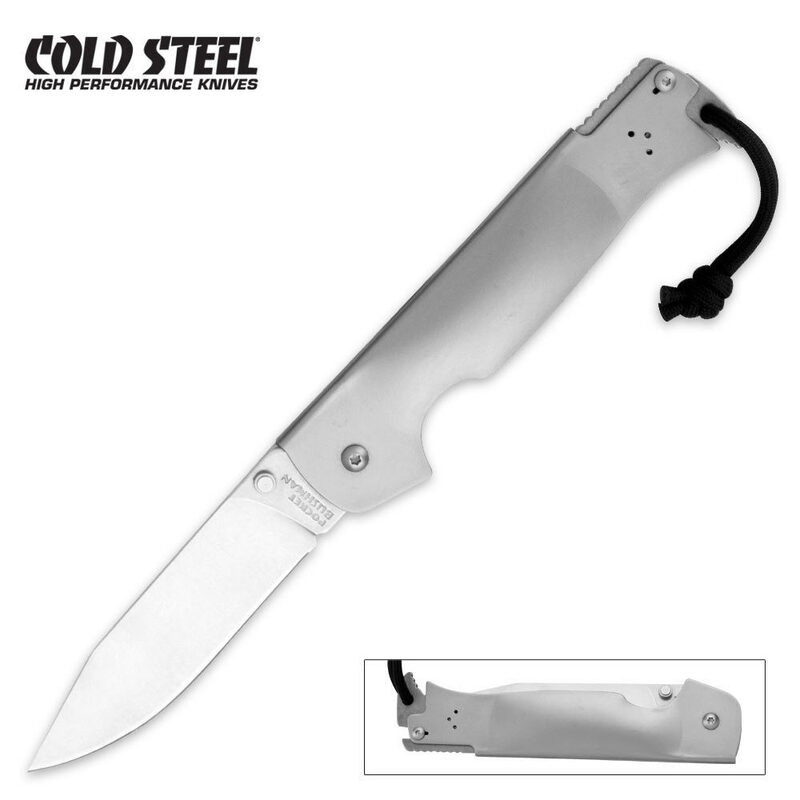 It is however built like a tank, the body is heavy duty stainless steel, the blade is over 4" and VERY sharp. This is one of the strongest action that I have seen so far, it has ambi buttons to open it but am 6'4" and 275lbs and I have a real hard time opening it with one thumb, it takes grasping blade with both fingers in order to open it, once open this becomes a very serious blade! to close it requires both hand, one to pull on cord while other hand slowly closes blade. This may not be the most convenient but again what a a blade, and for the low price (under $25.00) and high quality, if you are looking for a folder that will last under harsh conditions or in survival mode this is it! check it out, you won't regret it!